Solar power could help alleviate rural poverty. David J. Grimshaw and Sian Lewis shine a light on its progress, potential and pitfalls. Increasing access to energy is critical to ensuring socioeconomic development in the world's poorest countries. For these people, even access to a small amount of electricity could lead to life-saving improvements in agricultural productivity, health, education, communications and access to clean water. Options for expanding access to electricity in developing countries tend to focus on increasing centralised energy from fossil fuels such as oil, gas and coal, by expanding grid electricity. But this approach has little benefit for the rural poor. Grid extension in these areas is either impractical or too expensive. Neither does this strategy help tackle climate change. Power already accounts for 26 per cent of global greenhouse gas emissions and while most of this comes from the developed world, by 2030 developing countries are predicted to use 70 per cent more total annual energy than developed nations. There is therefore a clear need for pro-poor, low-carbon ways to improve access to electricity in the developing world — solar power could be one such solution. The Earth receives more solar energy in one hour than the world population consumes in an entire year. Almost all developing countries have enormous solar power potential — most of Africa, for example, has around 325 days of strong sunlight a year, delivering, on average, more than 6 kWh energy per square metre a day (see Figure 1). Figure 1: World map of potential solar power (solar insolation in kWh/m2/day) (credit: Hugh Ahlenius, UNEP/GRID-Arendal Maps and Graphics Library). And yet the countries that receive the most solar energy are often also the ones least able to benefit from it, due to a lack of knowledge and capacity to harness solar power and convert it into electricity. There are two ways of using power from the sun: collecting its heat (solar-thermal) or converting its light into electricity (photovoltaics). Solar-thermal devices use 'collectors' — ranging from flat plates put on roofs to parabolic dishes, power towers or solar pyramids used in solar power plants — to absorb sunlight and produce heat. Solar-thermal devices can be most simply used for heating or cooling but are also suitable for drying crops, pasteurising water or cooking (see Table 1). Through concentrating solar power (CSP) systems, that use a combination of lenses or mirrors and tracking systems to focus a large area of sunlight into a small beam, they can also be used to provide electricity. The concentrated sunlight heats water to produce steam to drive a turbine, connected to a generator. Solar photovoltaic (PV) systems use solar cells, linked together in 'modules' (solar panels), to convert light into electricity. They range from a few small cells that can run a calculator to huge solar power stations with thousands of solar panels. More than 90 per cent of PV systems are based on silicon materials. PV systems that are connected to the electricity grid include a device called an inverter to turn the direct current (DC) power generated by solar panels to the alternating current (AC) power used on the grid. Off-grid PV systems may also include an inverter but also require batteries to store surplus energy, and an electronic charge controller to prevent the batteries from overcharging. At present, solar-thermal systems are about 30 per cent efficient at turning heat into electricity — compared with approximately 15 per cent efficiency for PV systems. But, in the long run, the development of newer materials for PV systems, such as polymers and nanoparticles, should increase their efficiency. Neither solar-thermal nor PV are new technologies, but they are not widely used to generate electricity because, compared with carbon-based energy supplies, they remain relatively expensive. Yet with rising fossil fuel costs, growing concern about supplies — some analysts suggest we could run out of oil as early as 2025 — and increased awareness of fossil fuels' role in climate change, market conditions will increasingly favour solar power. Government subsidies may also help encourage the growth in solar power. Interest should rise further as technologies improve, production scales up and costs fall. The holy grail of solar power economics is to reach grid parity — where the unsubsidised cost of solar power is equal to, or cheaper than, the cost of conventional grid electricity. Analysis by management consulting firm McKinsey & Company forecasts that "by 2020 at least ten regions with strong sunlight will have reached grid parity". But these will almost certainly be within developed countries such as Italy, Japan, Spain and the United States. And for developing countries, even once grid-parity is reached, off-grid solutions will still be required to deliver power to remote communities. While the cost of large grid-connected solar systems will fall as solar panel prices drop, smaller off-grid systems are unlikely to see similar cost savings, partly because the price of batteries will remain high. Batteries can be as much as 40 per cent of an off-grid solar system's cost. And there is an additional cost associated with replacing them, because batteries are unlikely to last as long as solar panels. The efficiency of electrical appliances can also make a huge difference to the cost of supplying electricity through off-grid solar systems. The most common solar PV system in rural settings is the solar home system, made up of a solar panel, connected to a battery and charge controller. It usually includes at least one light and a socket to power other electrical equipment such as radios, televisions or mobile phone chargers (see Figure 3). Growth in solar home systems has been particularly strong in Asia — most notably in Bangladesh, China and India — where microfinance schemes or government and donor support has facilitated access. In Africa, the rise in solar home systems has been slower. But by 2007, the continent still had more than 500,000 systems in use, more than half of these in Kenya and South Africa. Most projects in rural Africa outside these two countries are relatively small. For example, Zara Solar Ltd is a small solar business that sells solar PV systems to rural communities in Tanzania. Set up by a local entrepreneur, the company has received support from several donors, including the World Bank, Lighting Africa and the Ashden Awards for sustainable energy, and has installed more than 4,000 solar systems in northern Tanzania. And despite high capital outlays and ongoing battery and maintenance costs, off-grid solar systems can save money. Zara Solar Ltd customers can pay back the cost of a solar home system in less than two years, given the right financing mechanisms. Solar systems can also power public buildings such as schools or rural health clinics. The Solar Electric Light Fund, for example, supports the installation of hybrid solar–diesel systems — that generate more than 90 per cent of their electricity from the sun — to power health clinics in several countries, including Burundi, Lesotho, Rwanda and, most recently, in Haiti, following the devastating earthquake in Port-au-Prince in January 2010. In many cases, clean good quality light can be provided with very little electricity — and low cost — with a huge impact on quality of life. Most villages in Africa, Asia, and Latin America rely on kerosene lamps and candles for their lighting. These cost the average household US$40–80 each year, emit pollutants that pose serious health risks, including respiratory or eye infections, kidney and liver problems and can cause house fires that kill people. It is a flexible sheet of PV cells that, when you clip the corners together glows with reading quality light. The prototypes cost US$27 per lamp and last for about one year. The development team are confident that costs can be reduced to US$7 — perhaps even half that if they outsource production to China — which would offer a significant advantage in both cost and health for local people. 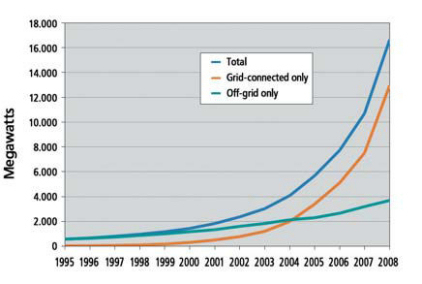 Indeed, solar energy is increasingly being used in a wide range of off-grid applications. (see Table 1). Solar panel provides electricity to power fridge; batteries store it to ensure continuous operation. KXN Nigeria Ltd has installed more than 189 vaccine solar fridges in northern Nigeria. Exposure to UV sunlight destroys pathogens and bacteria. Solar cooker heats water and WAPI (small tube/capsule containing wax that melts at 65°C — the temperature at which viruses and bacteria are killed) indicates when it is safe to drink. Adventures in Health, Education & Agriculture Development (AHEAD) have brought solar pasteurisation to more than 100,000 people in Tanzania. Solar panel drives electric motor which powers pump to feed water into reservoir/storage tank. More than 10,000 solar water pumps in use worldwide;  Research in Benin shows solar pumps for drip irrigation improved diets and incomes . Food is placed on mesh racks and dried as sun heats box. Fruits of the Nile in Uganda buys fruit from small farmers and uses solar driers to boost incomes of about 1400 people. PV cells charge battery, which provides DC voltage to 'live' wires in the fence. Community Markets for Conservation (COMACO) has installed solar fences in Zambia, protecting crops for more than 1500 families. Solar panel charges battery to power wifi antenna and router that 'hop' Internet signal from single broadband access point across multiple nodes. Green Wifi has set up wifi networks for schools in Panama and Senegal. PV cells charge battery to power socket. provides livelihoods (via charging stations). Digicel distribute solar phones in Haiti and Papua New Guinea; Safaricom sells solar phones in Kenya; Ericsson has installed 12 village charging stations in Millennium Villages across Africa . Solar panel powers batteries for transceiver. Improves rural communications; reduces transport costs; if connected to a laptop, also increases access to online information and advice. The Madrid Association of Engineers without borders uses solar radios to support health services for 50,000 people in rural Peru. Device such as mirror or reflective metal concentrates light and heat into small cooking area. Solar Cookers International supports solar cooker businesses across Africa, and has donated solar cookers to thousands of families in refugee camps in Chad, Ethiopia, Kenya and, most recently, Haiti. Collector heats fluid passing through it and heat is stored in tank. reduces carbon emissions and local pollution. In Rizhao, China, 99 per cent of homes use solar water heaters. Solar energy is also being used to bring other benefits — in many cases, it can provide the first step out of poverty by providing new skills and sources of income. For example, the nongovernmental organisation SolarAid trains entrepreneurs in developing countries in business planning and market research to help them set up small solar businesses to convert kerosene lamps into solar lanterns and build solar chargers or solar radios from local materials. Similarly, the nongovernmental organisation Barefoot College trains 'Barefoot Solar Engineers' (mostly from rural villages in Africa and Asia) to install, repair and maintain solar lighting units in an effort to promote rural solar electrification and boost incomes for poor villagers. By the end of 2009, the college had trained 461 solar engineers, including 211 women and, according to the college benefited an estimated nearly 900,000 people. But improving access to solar power for the rural poor in developing countries still faces a number of hurdles. Beyond the policy environment, which favours the development of fossil fuels, the most significant is funding. Access to solar power is either purchased in the open market or provided through international aid. There are a wide range of aid models in operation. Large donors such as the World Bank and the International Finance Corporation are major funders of solar PV in the developing world, supporting projects in Africa, Asia and Latin America valued at more than US$600 million. Specialist organisations such as SolarAid raise money to invest in solar systems for schools or communities with a focus on improving health, education and livelihoods. Manufacturers such as Sollatek donate a number of units to charities per month. But there is growing interest in moving away from straight aid towards strategies that enable the poor to finance their own energy needs. For example, microfinance providers, which offer small loans — often based on no collateral — to the poor, are proving vital to overcoming the relatively high capital cost of off-grid solar systems. Many such microfinance providers have been established using funds from major donors, such as the World Bank, but become self-sustaining in the long term through credit repayments. Those microfinance providers that specialise in selling solar PV systems often include support activities such as training, maintaining equipment and replacing parts, or disposing of damaged batteries. For example, Grameen Shakti, a microfinance provider in Bangladesh, has installed more than 320,000 solar home systems based on microcredit in the past decade and aims to increase this number to one million by 2012. It has trained more than 4,400 technicians (mostly women) and set up 45 'technology centres' to install and maintain solar systems locally. Microfinance providers can include charitable foundations, such as the Solar Energy Foundation that has installed more than 2000 solar home systems in Ethiopia. Banks may also offer microfinance. The Aryavart Gramin Bank in India, bulk-orders PV systems and provides purchase, installation and maintenance loans to rural customers. The credit repayments are cheaper than the monthly cost of kerosene and can be paid back over five years. Private solar businesses can also help in microfinance. The Indian company SELCO, for example, has sold more than 100,000 solar home systems in the past 13 years. While it doesn't make loans itself, it helps connect customers with microfinance providers, in many cases providing a 'down-payment guarantee' to help cover upfront capital payments. Governments should also take a role in making solar financially affordable — by supporting the system that gives the poor access to solar technology. This means investing in research and development for the technology itself, and using a system of subsidies to improve uptake of solar power and to support installation and maintenance costs. To ensure the benefits are felt by the rural poor in remote communities, such subsidies must favour decentralised, off-grid, small solar systems over centralised, fossil fuel-based solutions. Beyond financing, there are other hurdles to improving access to solar power for the poor. These include improving local ownership of solar technologies, weaving off-grid solar systems into climate change policies and targets for reducing global emissions, and scaling up production technologies to reduce capital costs. The bottom line is that scaling up solar power for the poor will depend on a mix of scientific improvements, policy initiatives, and collective action aimed at tackling climate change and electricity poverty. David J. Grimshaw is head of Practical Action's international programme in new technologies and senior research fellow in emerging technologies at the UK Department for International Development.